On this day in 1969, Apollo 12 was launched from Earth. It was the second human mission to the Moon — less than four months after Apollo 11 and five months before Apollo 13. People don’t tend to remember it. Apollo 11 was the first. And Apollo 13 was exciting in its failure. But you can hardly blame Americans for not caring about Apollo 12. It was covered by our media with all the seriousness that it covers politics. Just four months after people were riveted to their televisions about going to the Moon, they were as excited as they would have been had they broadcast a family vacation to Disneyland. That’s how it was covered. We were going to the Moon. When we had never been, it was a big deal. But seeing it again was kind of like seeing a magician perform the same trick again. The truth, of course, was that NASA was actually doing things. Even if you didn’t care about the science, there were technological improvements. Apollo 12, for example, manage to actually land where it intended to — allowing parts of Surveyor 3 to be returned to Earth. Humans would land on the moon only six times over the course of three and a half years. And we’ve never gone back. Now, in a sense, I don’t care. I’m not that fond of manned space exploration. What we’ve done with unmanned probes is amazing. But the fact that we went to the Moon a bunch of times in a short period and then stopped says a lot about us. One thing it says is that the people didn’t really care. Another thing is says is that the Apollo program was always primarily about the Cold War. And neither of those things speak well of us as a nation. There is an argument against it. Why are we not dealing with problems here at home. I’ve always loved the Gil Scott-Heron song “Whitey on the Moon.” Of course, if the government hadn’t been spending money going into space, it wouldn’t have spent that money making the lives of the Earth-bound population better. In fact, it would probably be using it to make their lives substantially worse. But at least Scott-Heron engages with the subject. He doesn’t ignore it, like the nation did and does. 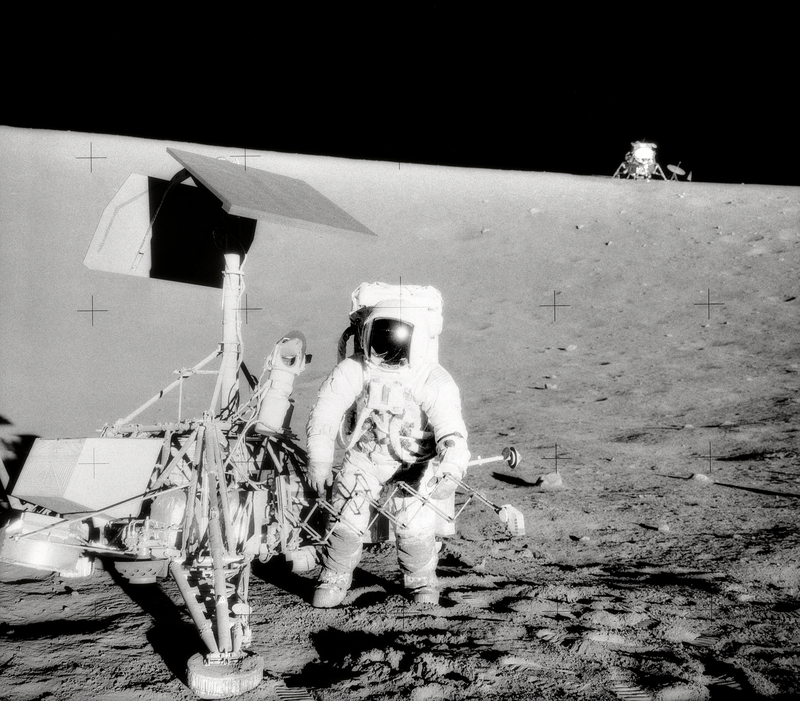 “Surveyor 3-Apollo 12” by NASA, Alan L. Bean – Image #AS12-48-7136 – GPN-2000-001316.jpg. Licensed under Public Domain via Commons. As far as I am concerned, space exploration should take the place of military spending. Voters want to spend money on concrete things, well fine, lets spend it on going to Mars, the Moon and Venus. One thing about manned spaceflight: it’s a lot more expensive. So that’s a reason to do it. Paul Krugman talks about fixing the economy with a military build up to counter an attack from Mars. Whatever it takes. Exactly and it may actually help fix some of our foreign affairs issues. The thing is that Republicans are always willing to spend money to stimulate the economy — as long as a Democrat is not in the White House. But I’m sure research on space weapons would create lots of great useful things. A better version of Tang at the very least.